This sculpture was one of my favourite from the South America largest Art Fair: ArteBa. This relative small sculpture shows delicacy, with a vulnerable material: the porcelain. The organic material which surrounds the characters: pasta and sponge, contributes as well to this fragility. The represented materials, being absorving, reflects the cultural integration by foreigners. Skin acts as a shield as well by cercling the characters. The maternal instinct of protection is revealed by the child carried, and the curve lines. 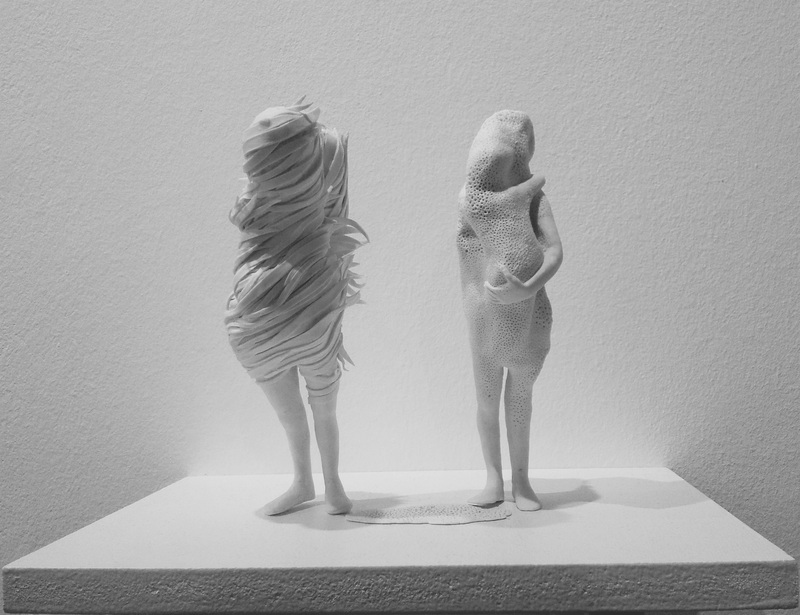 Fragility and protection, integration and family origins are two foreigners dualities shown with this wonderful sculptures. The artist Claudia Fontes, is an Argentinian artist who has worked in many places of Europe. She participates in many intercultural arts projects and often question the perception of culture in her work.